Not a posing shot, not a set up capture, a candid snap caught at the S.U.N. Festival ground in Northern Hungary. 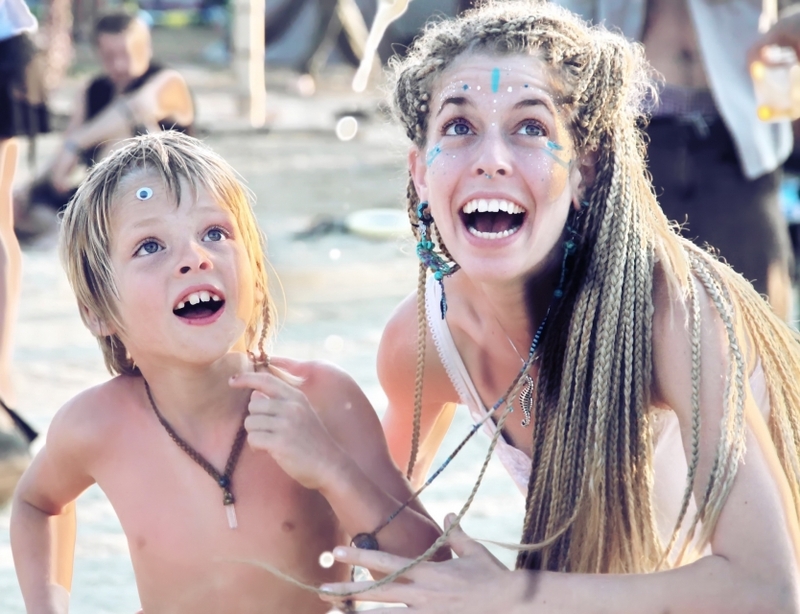 At such psychedelic tribal gatherings beside live performances of various subgenres of electronic psychedelic music, colorful outfits and positive vibe among the attendants, one can encounter skillful jugglers, hoopers and people who create giant soap bubbles. As I spotted the creative XXL spheres roaming above the main stage, I traced their "birthplace". I focused on catching light refraction on the huge bubbles, mirroring the festival ground. The making of the bubbles draw the attention of the kids nearby, they were first amazed by the not common size of the spheres, later on they true a challenge among themselves, who can pop the most bubbles, what didn't quite helped my quest of taking creative pics. That's why I shifted priorities - let's focus on the playful kids instead. I caught this moment when, presumably, the mom of the boy joined the soap bubble gazing. Luckily, they were so mesmerized by the birth of the spheres, that they didn't noticed being locked by my lens.